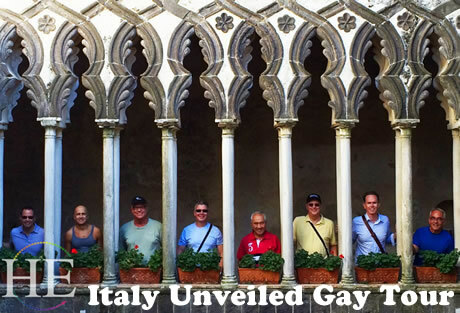 Rome, Pompeii, Positano, Amalfi Coast, Capri, Matera, Ostuni, Castel del Monte, Trani, Alberobello, and more! Our tour starts at our classical hotel in the heart of the "Eternal City" of Rome, a stunning collection of classical antiquities, medieval buildings, Renaissance palaces and Baroque churches. History lives side by side with contemporary life with incredible ease. One can walk along the footsteps of Caesar, then dance in the splendor of Italy's most fashionable trendsetters. We can arrange additional time in Rome for anyone who wants to immerse themselves in this fascinating city. • Begin your tour in the heart of Rome. • Stroll the streets of the well-preserved city of Pompeii, lost in a volcanic eruption during Roman times. 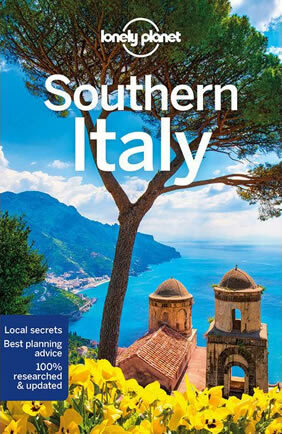 • Explore the villages of the Amalfi Coast that hug the hillsides above the Mediterranean Sea. • Gaze at the unique architecture of Positano from the terrace of our hotel. 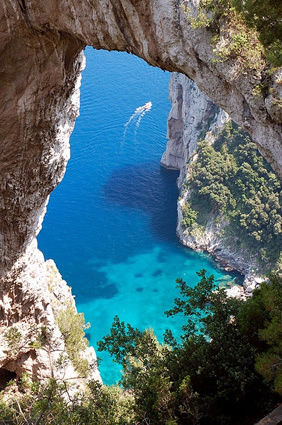 • Wander mountain paths and city lanes on the storied Isle of Capri. 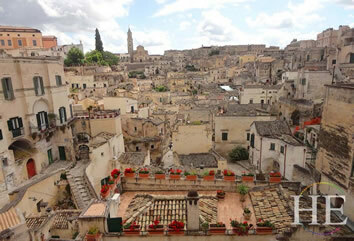 • Spend two nights in a Matera hotel, housed in a cave that was once a church. • Walk the rugged paths used for Jerusalem scenes of the film The Passion of the Christ. • See the conical buildings called "trulli" in the countryside around Ostuni. 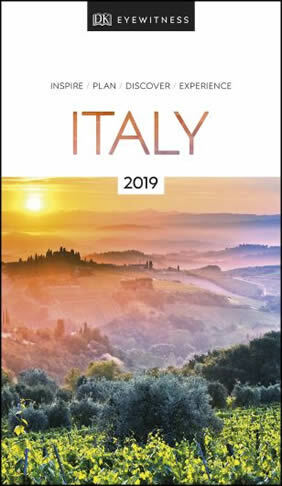 • Visit the grand hilltop 13th Century Castel del Monte and the Romanesque Adriatic fishing port of Trani, including a synagogue built in the 13th Century. Day 1 - Welcome to Roma! After checking out of our hotel, we will head to the main train station to board the high-speed train to Naples. We’ll meet our driver and guide for an introductory tour of Naples and a stop for lunch in an historical pizzeria. . Next we will visit the archaeological site of Pompeii, a wealthy Roman city buried under ash after a cataclysmic eruption of nearby Mt. Vesuvius in 79 AD. The incredibly preserved art and artifacts of this city give a window into the daily life of Romans nearly 2000 years ago. Pompeii has fascinated visitors and historians for centuries, and research continues to this day. 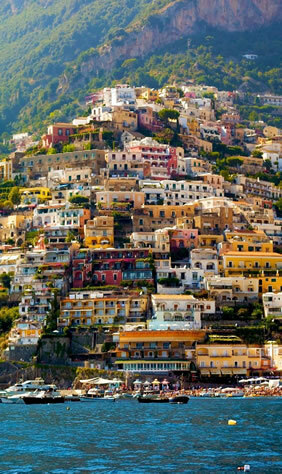 Later we will will continue to Positano and check in to our exquisite hotel located high on the cliffs of the Amalfi Coast. Our boutique hotel hugs the mountainside, and enjoys one of the most beautiful vistas in Southern Italy (picture the rugged Italian coastline from movies such as Under the Tuscan Sun). We’ll spend three nights here exploring the region by day, then relaxing over dinner with some of the most famous views in the world. 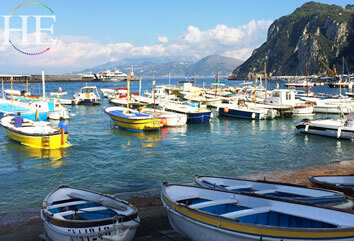 This morning, weather permitting, we shall walk down to Positano Pier and board the fast ferry to Capri Island. 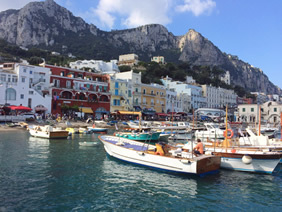 Upon arrival, we will meet our local guide, who will be with us the entire day, then board a ferry to Capri Island. We’ll hop onto the funicular, which takes us on a fantastic ride up to the hilltop town of Capri. We’ll take a walking tour to the public gardens, which offer an outstanding view of the island. Lunch is on your own to select from one of the many small cafes that dot the town. This morning, enjoy an amazing guided tour of the Amalfi Coast which features a luncheon overlooking the Mediterranean Sea in the town of Amalfi. This picturesque village from which the coast derives its name was the first Italian maritime republic to play a major role in Mediterranean trading, with an extensive network in Egypt and Byzantium to the east. With a population that reached 70,000 (compared with the current 5300) and power that competed with Pisa and Genoa, Amalfitani merchants took away the Mediterranean trade monopoly from the Arabs and founded mercantile bases in Southern Italy and the Middle East as early as the 10th century. Amalfi emissaries were the first to create a robust trade with Constantinople, present day Istanbul. Their Amalfian Laws of the Middle Ages represented the first codified rules of maritime law for the Mediterranean region. "Certain sections of the city are 2000 years old, and the architecture, the blocks of stone, the surrounding areas and rocky terrain added a vista and backdrop that we [used] to create the backdrops for our lavish sets of Jerusalem. We relied heavily on the look that was there. In fact, the first time I saw it, I just went crazy, because it was so perfect." Today's drive takes us into the Puglia region and to the historical fortified hilltop town of Ostuni. Ostuni features ancient city walls, white buildings on the hillsides, and views across olive groves to the nearby Adriatic Sea. We are now on the opposite coast from Amalfi, with a completely different landscape featuring a gentle slope to the sea instead of the dramatic cliff-side villages of the Amalfi Coast. During our tour we will see the town's largest buildings, the Cathedral and Bishop's Palace, as well some grand homes built for the town's aristocrats. Our hotel rooms for the next three nights are in a restored historical building that is one of the finest boutique hotels in the region. We'll have the afternoon and evening to ourselves in order to to independently explore the lanes and byways of surrounding town. Our guide will be happy to provide recommendations for activities and dinner experiences. Today we will drive to Castel del Monte, a UNESCO World Heritage Site that is featured on the back of the Euro pennies distributed in Italy. Built in the 13th century this was the grandest of 200 castles built by the Swabian Emperor, Frederick II, and the only octagonal castle. Castel del Monte is perched atop a hill, overlooking all of Puglia and the Adriatic. The castle is featured in many myths and historic accounts, including the legend of the Holy Grail. From Castel del Monte we will head to the charming Romanesque fishing port of Trani. This Adriatic port was both a thriving commercial port and the departing point for some of the Crusades. Historically Trani was also home to southern Italy's largest Jewish community, for which the impressive Scolanova synagogue was built. The first Jews of Trani were likely fleeing persecution at the hands of Spanish rulers around 1144 A.D. The synagogue was converted to a church in 1380, but reverted to its original role in 2006. A protected fresco of the Virgin Mary remains in the area that originally held the Torah, but the portrait is now discreetly covered by a menorah. Today we will visit nearby villages such as Alberobello that feature buildings designed in the iconic trulli (trullo) style. They are shaped like a cylinder with a cone-shaped limestone-tiled roof, which is often painted with a cross or other symbol. The walls are very thick which keeps the interiors cooler in the summer and warmer in the winter. Residents of this region built the first trulli many centuries ago, but the oldest ones still intact date to the 1500s (recent in Italian terms!). We’ll enjoy lunch together in a typical farm house of the region. 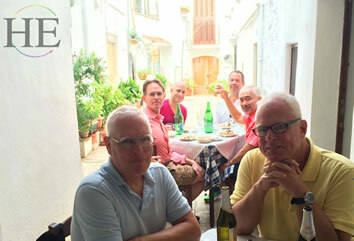 Day 10 - Farewell to Puglia! • All hotel service charges, government taxes, porterage, and gratuities included meals. This tour starts in Rome and ends with transfer from our hotel in the Puglia region to Bari Airport. To fully enjoy this tour you should feel comfortable walking on hills, steps and uneven surfaces.